Janet Serino is the superintendent of Wyoming Area School District in Luzerne County, Pa. A PA Post look at superintendent salaries in the state found that there are many more male superintendents, but female superintendents earn a higher salary on average. 'You are, as a female, really having to stand up, and maybe sometimes stand up a little taller and be noticed,' said one superintendent. The handshake might seem like a small thing. But Janet Serino notices it. Serino has worked in education for more than 40 years. She’s now a superintendent at a school district in Luzerne County, an area without any other women in similar positions. Serino think she is sometimes treated differently than her male colleagues. The handshake is one small way. Statewide, about 73 percent of classroom teachers in public schools last year were women. But only about 28 percent of school district superintendent were, according to a PA Post analysis of state data. The disparity is common nationwide and it can limit options for women, said Ed Fuller, an associate professor of education at Penn State. And for school districts, it can prevent them from hiring the best candidates. “Your pool is not as capable as it otherwise would be,” Fuller said. In the interactive map below, you can click on a district to see the salary and gender for the superintendent. Districts with male superintendents are in purple, while districts in green have female superintendents. Data is based on the 2017-18 school year. Pennsylvania doesn’t have a great track record of electing women to public office. The state has never elected a female governor or U.S. senator, and until this past election, it had a dubious distinction: It was the largest state without a woman in its delegation to Congress. Superintendents are not elected in Pennsylvania. Instead, they are hired by an elected school board, which negotiates contracts with them. The PA Post analysis did find some positive signs for people who want a more level field. Women who do hold the superintendent job tend to earn a little more than their male counterparts. The median salary for a male superintendent was $137,000, while the median salary for a female superintendent was $139,525. But female superintendents were also more likely to have a doctoral degree, which could influence their compensation. The number of women superintendents in Pennsylvania is higher than the national average of about 23 percent. Still, the disparity between the number of male and female superintendents is a large one. 1. There’s discrimination both before it’s time to hire a superintendent and at the hiring point. The role of high school principal is often a stepping stone to become a superintendent. But hiring committees and school boards often “have a perception that men are more qualified to lead large and complex organizations, such as high schools and school districts,” he said. So women are often not seriously considered for those leadership roles. 2. There’s disparity at home. The superintendent job requires a lot of hours, and women tend to pick up more of the childcare and household responsibilities at home than men do, Fuller said. 3. The status quo is hard to change. Often, someone in a leadership position needs to recognize a person’s potential to become a principal or superintendent. “If all the individuals in leadership positions are white males then it decreases the likelihood that they’ll identify the women to get in the pipeline to become a superintendent,” Fuller said. Lynn Fuini-Hetten is one of the educators who wants to become a superintendent. 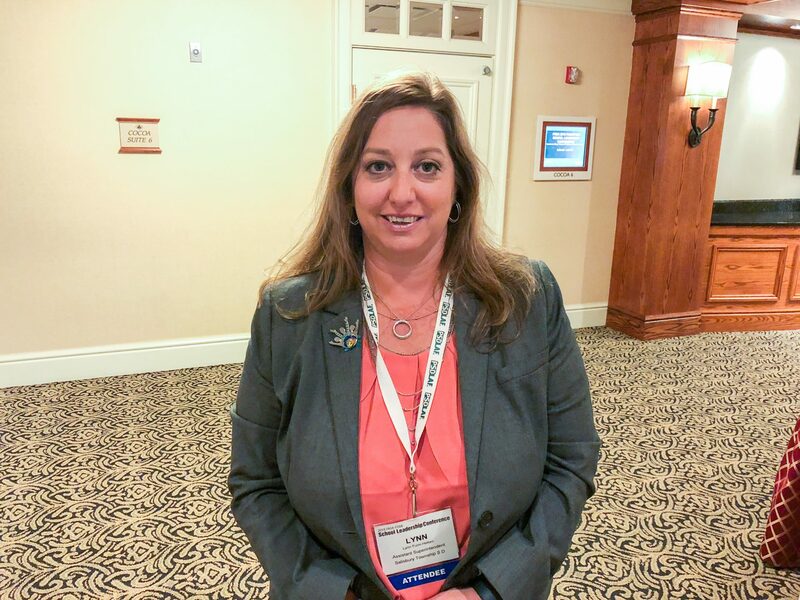 Fuini-Hetten is also the president of the Women’s Caucus of the Pennsylvania Association of School Administrators, which aims improve opportunities for women. Fuini-Hetten said she’s never been treated any less than a man in her school district. When it comes to going into administration, she thinks it comes down what a person wants. Fuini-Hetten decided to become an educator in high school, after participating in an assistant teaching program. After graduating from college in 1993, she spent 15 years as a middle school teacher in the Salisbury Township School District in the Lehigh Valley. She became an instructional coach, and that led to other roles more focused on administration. Now, she’s the associate superintendent in the district. Working in the central office convinced her she wants to be a superintendent, as way to build a vision for the community and leaders. She notes there are sacrifices and time demands to the administrative jobs, whether it’s having to choose between a district event or her son’s soccer game. Several years ago, she started a doctoral program, and took superintendent classes at the doctoral level that have helped her. But after a position change, she chose not to prioritize completing a dissertation and doctoral degree. Statewide, about 65 percent of female superintendents had a doctoral degree, while about 48 percent of male superintendents had a doctoral degree, according to the PA Post analysis. The records don’t indicate whether they earned the doctoral degree before after being hired as a superintendent. There’s also a level of uncertainty in top administrative positions. They don’t have the same kinds of protection as, say, a classroom teacher represented by a union. The same school board members who hired administrators and negotiated contracts with them can decide to go in a different direction and not renew the contracts. Or new school board members could take office. Lynn Fuini-Hetten is the associate superintendent of Salisbury Township School District in Lehigh County. She is seen here at a conference in Hershey on Oct. 18, 2018. Last year, Serino was the only female superintendent in Luzerne County, according to the state data. She leads Wyoming Area School District, home of the Warriors, the same district she graduated from in 1970. It’s located between Scranton and Wilkes-Barre, along the Susquehanna River. About 2,300 students attend classes there. Growing up, Serino knew she wanted to work with children. She never thought of any other job but teaching. She started out as a parochial school teacher, because couldn’t find a full-time job with a public school. She later became a parochial school principal. Then after Wyoming officials recruited her, Serino worked in several different administrative roles. “You are, as a female, really having to stand up, and maybe sometimes stand up a little taller and be noticed,” Serino said. Serino’s former boss encouraged her to pursue the role. She wasn’t sure she wanted the job. She liked the interactions she had with children and parents. She wasn’t sure if she wanted her focus to shift too far from that part of education. But she decided to pursue the superintendent job, and the board named her to the position in 2013. She became the first woman to lead the district in its history. Serino has also dealt with a variety of challenges. There are the routine ones like budgets and collective bargaining as well as standardized test preparation and snow days. Then there are the less routine ones, like in 2017, when the high school valedictorian had his microphone cut off by a principal after going off-script during the graduation ceremony. The event got national attention, including from comedian Jimmy Kimmel’s late night talk show. Serino met with the student, including one meeting that was covered by a TV station. And earlier this year, she told The Citizens’ Voice the conflict ultimately led to improved communications between students and administrators. In this day and age, school safety issues are receiving more and more attention in schools. Last year, following the Parkland, Fla., shooting that left 17 students and staff members dead, a bathroom threat at Wyoming Area Secondary Center led to a lockdown that lasted several hours. The school then added a full-time metal detector requirement for entering the school. Some of the choices are difficult, and there are things you have to do that you’re not always happy about, Serino said. But she likes the job. She’s made interacting with students, working on curriculum and understanding all details of the organization a priority. She likes problem solving, working with a team and empowering others. Her school board extended her contact in 2017. She plans to retire when it expires in 2022. For Serino, the superintendent job was one that made sense near the end of her career. “I do think that if you’re really looking to change the lives of children and leave a legacy … it’s an ideal situation to be in,” Serino said. And it’s a situation that she hopes more women reach. In the interactive map below, you can see how many male vs. female superintendents there were in Pennsylvania counties in 2017-18. Gray = Some female superintendents, but less than half the superintendents in a county were women. Black = Half the superintendents or more in a county were women. Source: Pennsylvania Department of Education data; PA Post analysis.